Cause and Effect, refers to the concept of Causality (also referred to as causation) is the relation between an event (the cause) and a second event (the effect), where the second event is understood as a consequence of the first. Not 1, 2, 3, 4, 5, “I’m taking my talents to south beach” allegiance that would engineer one team the opportunity to have three Free Agent All-Star players combine on one roster. But wait, that would only come shortly after one storied franchise did similar years before but instead of building through free agency or draft they traded all assets to acquire the trio. Most things happen due to cause and effect and the newest trends of the NBA are a testament to that. After Miami’s formed the big three, the NBA’s collective bargaining agreement had just ended and players and owners were forced to make decision that help benefit each other, as they say, but instead forced players and fans to suffer with another lockout. During the lockout Owners wanted to have a higher BRI (Basketball Related Income) and players disagreed. Derek Fisher (the irony right) stood along the NBPA to bring back basketball. The sides came to an agreement but something’s changed including the salary cap, to help benefit smaller market teams from losing their superstars, and also changing max contracts to 5 years, so change is evident to come about. We just came off an offseason where seen the most superstars in my recent becoming free agent including the league’s biggest star LeBron James. James, remained loyal to his fans in Cleveland, his hometown team that he helped propel the franchise to yearly competitors, including a trip the 2007 Finals, but Cleveland could not give the King a good supporting cast. James was given the opportunity to give himself the right opportunity to and make the best career decision. How often the does the best player gets the opportunity to do that for himself? Not often, most would argue that Magic, Jordan, Bird and etc., would never do the same but how many of them were surrounded with the same incompetent cast throughout their career? Exactly so if Owners and other in the front office cannot get the job, why not take matter into your own hands. Not all superstars that are in small markets want to explore different options in a huge market (i.e. Kevin Durant, Tim Duncan). But for the most part they want to leave because of lack of basketball moves by the front office and having the opportunity to compete for a NBA Championship. 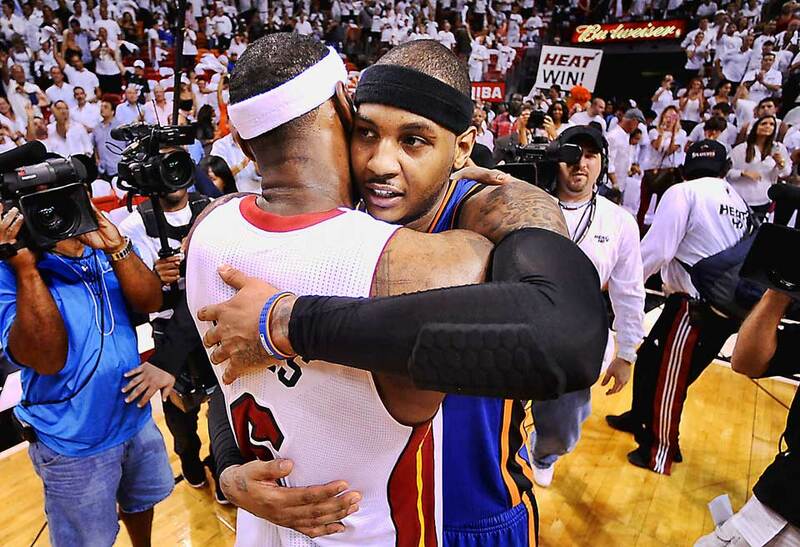 Recently Carmelo Anthony has been in reports to joining LeBron James and the Miami Heat, when he opts out of contract this summer. Anthony is in a similar situation in New York to James in Cleveland. When your career begins to dwindle down, how many more opportunities do you get to win a NBA Championship? Anthony is willing to walk away from 23 million dollars for this upcoming season to chase his championship aspirations. After experiencing nearly any success in Denver, he was traded to New York where he is suffering the same fate. Does it say a lot about Carmelo’s attitude and perseverance, or was he not in the best of situations. He came from a small market team in Denver that could not put the right pieces around him to now in New York with a money hungry owner that traded away the franchise’s future to receive the superstar. The idea that players can now choose their own fate comes on the heels over Owners’ and other front office personnel that do not make the correct moves to keep teams and build long term situations is shown greatly. I am not opposed to the idea at all, and shows a new era of the NBA and could give the league an extremely great look or totally bad perception as well. I am afraid of the “If we can’t beat them then join them” effect happening in the NBA and take away from the various amounts of talent spread across and making one all-star team that wants to win a championship. As long as the talent is distributed evenly throughout the league, then I will be a happy customer but I believe that it will become oversaturated if these situations keep coming about.